Anyone looking for equipment of proven quality right from the start will be delighted by the Swarovski ATS 85HD spotting scope. It offers all the features that you would look for in a spotting scope, including a tried-and-tested, lightweight design and perfect optics. As some of the lightest quality spotting scopes in the world, they are characterised by detailed optics with exceptional edge-to-edge sharpness and colour fidelity. Ideal for use when frequently changing viewing location: these extremely easy to handle and compact telescopes have a robust aluminium housing and fully rubberised armouring which delivers a unsurpassed performance offering all-round, colour-fidelity with strong contrast-rich images. Extremely detailed observation is the norm with a close focusing facility down to 3 metres (10 feet). Integrated objective lens protection. Reduces glare and diffused light as well as protecting against rain and snow. Lock mechanism in ultimate extended position: cannot move on its own and silent to handle. Very light weight at only 1,300g, despite the fully rubberised armouring: easy to handle even in cold weather. Extremely light, but very sturdy light alloy housing. Tilting tripod ring (angled models only) for setting to preferred observation position. Standardised foot fits Swarovski tripods without additional plate or all tripods with 1/4' and 3/8' threads. Internal focusing for dustproof and watertight qualities with no fogging thanks to nitrogen filling, protected against infestation of fungus. Easy-grip ergonomically-positioned focusing ring with larger grooves for quick and precise focusing. Removable aid for quick target pick-up. Cover glass to protect against dust, dirt and water, when eyepiece is not connected. Full field of view even for eyeglass-wearers due to individually adjustable twist-in eye cups. Bayonet connector for simple and rapid changeover of eyepiece and camera adapters. 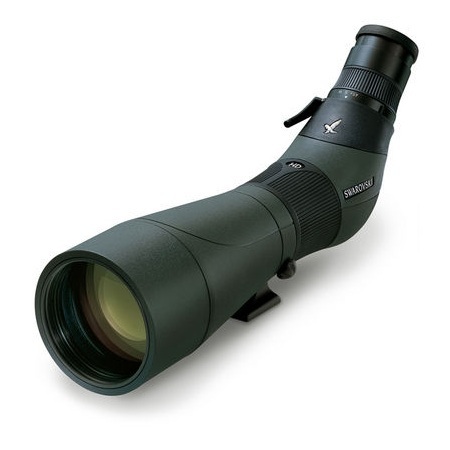 Fitted with the Swarovski 20-60x zoom eyepiece, it provides bright, crystal clear images right up to the image periphery over a wide range of magnification.